Los Angeles is a city known for many things—Hollywood, perpetual sunshine, picturesque beaches, and most notoriously, a sprawling, car-dependent culture. Despite the outdoorsy lifestyle most locals in the region enjoy, it’s tough to get anywhere (even the trailhead of your favorite hiking spot) without hopping in the car. But the Los Angeles River Corp’s Greenway 2020 movement is well positioned to change that. Six short years from now, says Maria Camacho, Greenway 2020’s director, you just might be able to bike all the way from the San Fernando Valley to Long Beach along a connected car-free path tracing the L.A. River. The way Camacho—who grew up in the Valley and calls herself “an L.A. girl through and through”—sees it, the L.A. River has the power to connect all of the city’s distinctive neighborhoods, while giving residents the means for enjoying all of that without always having to rely on their cars. Camacho recently gave Zipcar an inside look at how Greenway 2020 is aiming to transform the current concrete channel into one of the most vibrant riverside green spaces in the United States. 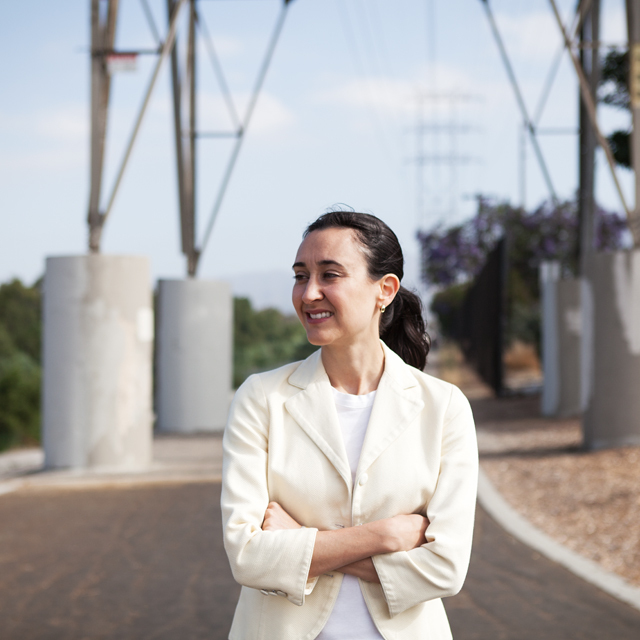 Maria Camacho, Greenway 2020’s director, has big dreams to connect LA River–adjacent communities. Zipcar: What function does the L.A. River serve now, and how might that change in the near future? Maria: Most of the river’s 51 miles flow within a concrete channel, serving the vital but singular function as a flood control measure for both the city and county. That’s limited the vast potential of the river as a focal point for economic growth and community revitalization. After decades of living with the river as it is, locals want to see parks, wildlife habitats, and an active transportation corridor along it. Greenway 2020 will be the first step in connecting all 51 miles of the river, and we’re aiming to do that by the year 2020. Our challenge isn’t a technical one. It’s a hearts-and-minds one. This is our region, our river, our time. How would you describe your organization’s vision? If you’ve ever lived in or even visited Southern California, you’ve likely enjoyed a beautiful day at the beach. Our goal is to make biking, strolling—and better yet—kayaking along the L.A. River as enjoyable as going to the beach. Think about the High Line in New York City. Imagine a 51-mile, linear “Central Park” running through the Los Angeles region. A place where you can bike from the San Fernando Valley to Long Beach and along the way enjoy a lemonade, spot herons and egrets, or explore the diversity of the area through public art. Will it soon be possible to ride a bike from one end of L.A. to the other on a car-free path? Yes, that’s the goal. There are some areas along the river in L.A. proper that have existing or newly installed bike paths, or new ones planned, but the problem is the lack of connectedness between them. Currently, approximately 26 of the 51 miles of the river connect, but much of it needs to be transformed. We want to fill in the gaps and make a continuous path with cafés, shops, and public gathering spots, and usher in a non-motorized transportation network. The riverfront today; a peek at the proposed transformation, complete with bike and pedestrian ramps for recreation and sustainable travel. Rendering courtesy of Maria Camacho/LA River Revitalization Corporation. What are the challenges you’ll face in taking the vision from concept to reality? Realizing our goals will certainly require substantial resources—both financial and political. We’re enlisting corporate and philanthropic entities to join us in our efforts. For example, NBC/Universal has committed more than $13 million to connect six miles of the river near its studio with a bike path and river park. We’ll continue to look to major industries who call the L.A. region home to be actively engaged. There’s no question that employers, employees, and visitors alike will reap benefits when we’re talking about connecting our neighborhoods, creating an alternative means for transportation, and investing in our regional economy. What do you consider the organization’s biggest accomplishment thus far? I don't think there is one thing in particular, but it's the more recent upsurge in momentum toward the river's revitalization that’s most exciting! In 2011, President Obama named the L.A. River—one of only two sites in California—as part of America’s Great Outdoors initiative. And last year, the river was made part of the Urban Waters Federal Partnership. Both are examples of the federal government supporting our local efforts to transform this overlooked part of our city—the river—into a center of revival. Right now, we’re finalizing fundraising efforts for our first major project. We’re designing the first promenade with a proposed café and boathouse, anchored by a 300-foot bicycle-pedestrian-equestrian bridge near Griffith Park and a 150-foot tall mast that signals the river isn’t just something we cross, it’s a destination. What’s next for you and Greenway 2020? The better question is what's not next for me and our organization? I know for sure I want to focus on community engagement across all 51 miles, so that I can not only educate those communities on the history of the vision, but also find out the ways in which the diverse residents adjacent to the river's path want to see their river transform.